Riot (third right) and Vignaesvaran (left) give their thumbs up for the NECT-GEN IR4 Report after a symbolic launching ceremony. KUCHING: Malaysia could lose up to 65 per cent of the current jobs in small and medium-sized enterprises (SMEs) by year 2027 if companies fail to embrace Industry Revolution 4.0 (IR4). Highlighting this, Minister of Human Resources Dato Sri Richard Riot Jaem stressed on the urgency to prepare the workforce and businesses for the new revolution. “Today, Malaysia’s economy is the fourth largest in Southeast Asia and the third richest by gross domestic product (GDP) per capita values. “SMEs make up 98 per cent of business in Malaysia and account for 65 per cent of the country’s employment. 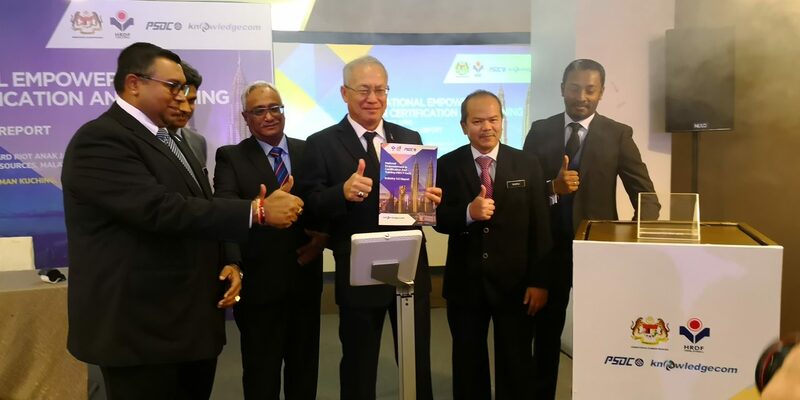 It is, therefore, vital for SMEs being in such a position to embrace IR4,” he said at the launching of the ‘National Empowerment in Certification and Training for Next Generation Workforce/Workers (NECT-Gen) Report 2018 by KnowledgeCom Sdn Bhd and Penang Skills Development Centre (PSDC) here today. Riot noted that while more than 5,000 foreign multi-national companies in Malaysia have adopted IR4 practices, unfortunately the SMEs hesitated. “They (SMEs) think that training is an expensive affair, trained workers may join competitors so becoming a burden more than an advantage and that Industry (Revolution) 4.0 is a ‘futuristic idea’ that may not actually affect them. “The job market is already competitive, with SMEs still relying heavily on foreign labour. The Ministry of International Trade and Industry (MITI) has warned that this is not sustainable in the long run, and this is why Malaysian manufacturers must embrace Industry (Revolution) 4.0,” he said. The time has come to embrace this revolution, Riot reiterated, while urging that matter of upskilling and reskilling must be taken seriously as it is necessary to boost Malaysia’s human capital across the board. “It is for this reason that my ministry, through departments and agencies including HDRF, is taking an active stand to assist the Malaysian government in upgrading the skills sets of Malaysian employees to ensure the seamless transition of this revolution across companies in Malaysia, especially among our SMEs,” he said. Riot thus hoped that more companies will follow in the footsteps of organisations such as HDRF, PSDC and KnowledgeCom. “We must take a stand to prevent our SMEs from crumbling, to prevent an increase in the country’s unemployment rate, and to ensure we meet our goal of a high income nation status through 35 per cent skilled local workforce,” he added. HRDF, he continued, has gone through great lengths to take the lead in upskilling, reskilling and multi-skilling efforts, making programmes affordable and accessible to a wider audience. “Change is hard but it is inevitable and necessary, which is why HDRF is collaborating with PSDC and KnowledgeCom to create this programme called NECT-Gen,” he said. Launched in 2017, the idea was to collaborate with universities and polytechnics to embed Industry Revolution 4.0 driven courses into the present system and to fund some of the courses as well. Human Resources Development Fund (HRDF) chief executive Dato CM Vignaesvaran Jeyandran was also present.